Happy New Year. Hope everyone had a great and safe celebration to ring in 2013. Over the years as I’ve developed a liking for whisky, Crown Royal has been my go to brand on a regular basis. I’ve liked the slight sweet edge it has over any other whisky. It’s a bit more in cost than other brands, but so worth it since it’s widely available at any bar or restaurant. More than a year ago, a local bartender suggested to me the Crown Royal Black blend. I decided to try it over the rocks and I liked it. It was a smoother taste than regular Crown. It didn’t quite have the normal bite to it, which I liked for sipping. There is also a slight hint of vanilla, which I’m going to say helps give it that extra smoothness. But I didn’t like the sweetness that mixing it with cola gave. I had liked Jim Beam and water on the rocks and decided to try it with Crown Royal Black. Too diluted. It actually took away the taste of the smoothness the Black gave. 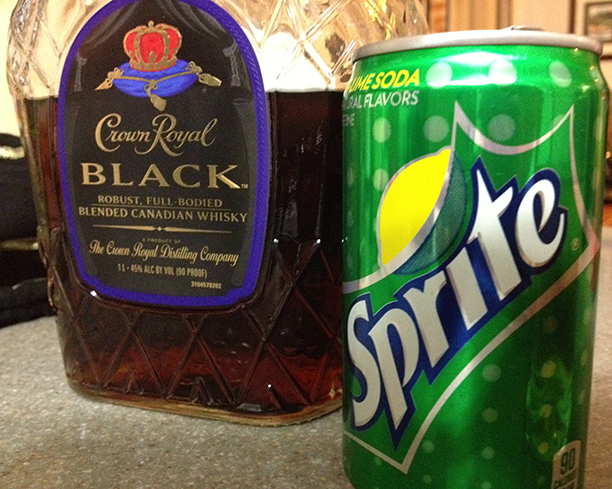 So another friend, who drinks Makers Mark and Sprite suggested I try Sprite with the Crown Royal Black. Amazingly fresh. With just the right amount of sweet. I tried regular Crown with Sprite and while it’s good, there’s just something about the Crown Royal Black that mixes much better with Sprite. Anyone else try Crown Royal Black? Opinions? Suggested mixers?